Result: The following dialog appears from which you choose and configure the analysis that you want to use. As with SIMetrix, you can also enter the "raw" netlist command in the F11 window. The contents of this window remain synchronised with the "Choose Analysis dialog box" settings so that you can freely switch between the two methods. 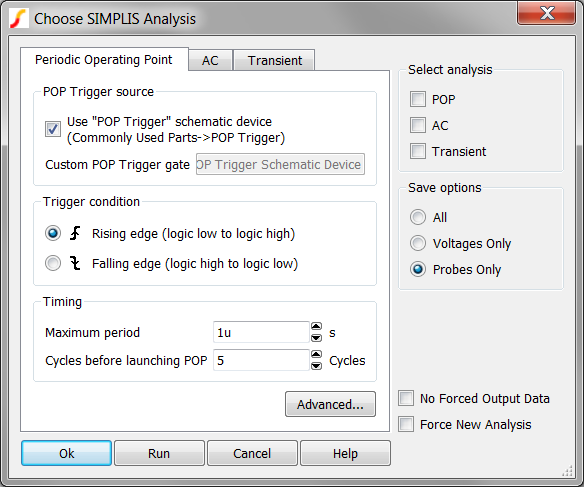 For more information on SIMPLIS analysis modes including details of the netlist commands, see the SIMPLIS Reference (Help > Online Manuals > SIMPLIS Simulator Reference Manual).